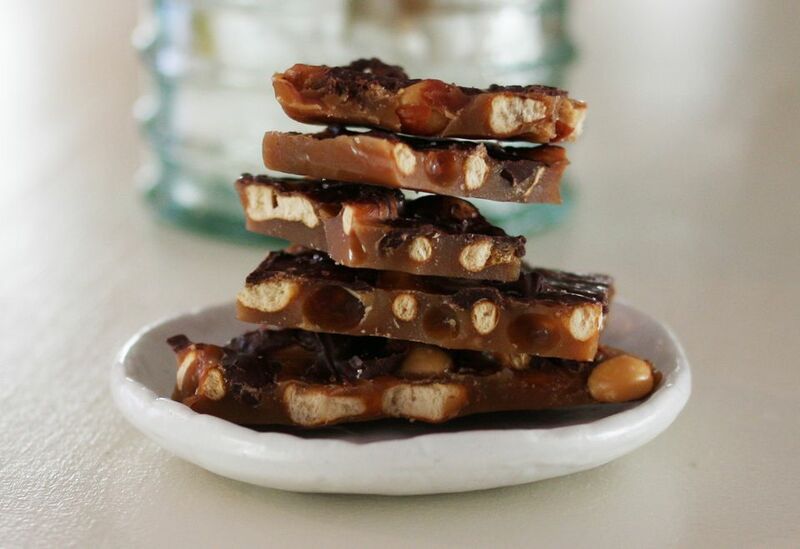 This pretzel toffee candy is ridiculously easy to fix, and it's the perfect quick treat to make for weekends and holidays. Sprinkle the toffee with a little sea salt if you like, and use peanuts or pecans in the toffee or leave the nuts out. Line a 10-by-15-inch jelly roll pan with foil. Heat the oven to 375 F.
Break the pretzels into smaller pieces and arrange them in a single layer over the bottom of the pan. Sprinkle the peanuts and pecans in and around the pretzels, if using. In a deep saucepan over medium heat, combine the butter and brown sugar. Cook, stirring until the butter has melted. Bring the mixture to a boil. Continue boiling without stirring for 3 minutes. Remove the hot butter and brown sugar mixture from the heat and stir in the vanilla. Pour it evenly over the pretzel layer in the pan. Transfer the pan to the preheated oven and bake for about 5 to 6 minutes. It should be bubbling all over. Remove the pan from the oven and immediately sprinkle with the chocolate chips. Use 1 1/2 cups or more for a thicker chocolate layer. Let the chocolate chips soften and then spread gently to cover the candy. If you like the salted caramel taste, sprinkle lightly with flaky sea salt. Let the mixture cool completely. Break up and store in an airtight container (put wax paper or parchment between layers) for up to 2 weeks.